High tensile strength 4340 Chromoly is heat-treated, tempered and induction hardened to produce these heavy-duty axles that are up to 40% stronger than stock 1040 axles. Each axle shaft is backed by Alloy USAs exclusive ten-year warranty! We use the latest splining technology to produce splines that are stronger than traditional cut splines. The shafts are then precision CNC machined and magnaflux inspected for cracks before receiving a slick black anodized finish. 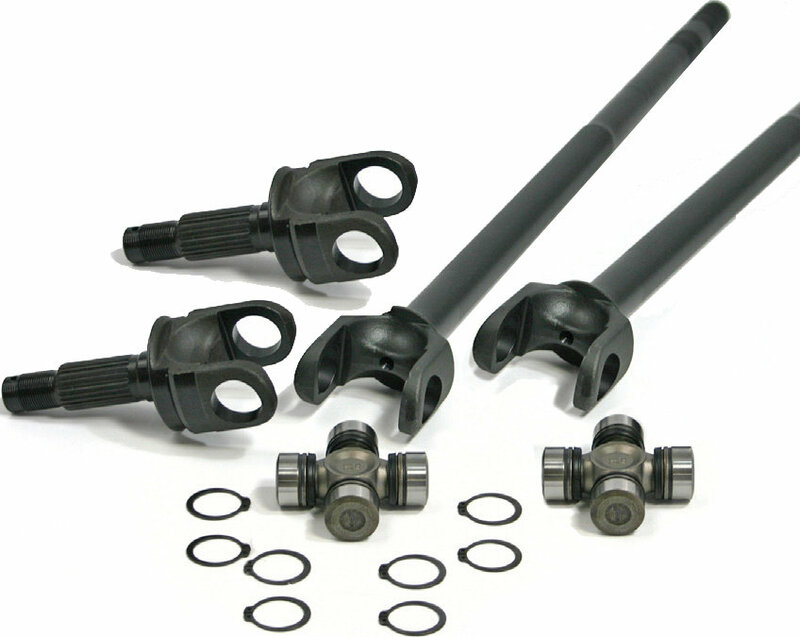 Our front axle shaft kits include everything you need to complete the job: both passenger and drive side inner and outer axle shafts, seals, U-joints and clips. 1. Jeep Wrangler (TJ) 97-06, Cherokee (XJ) 92-01, Dana 30 Grande 30-Spline Kit.